Keys are locked securely inside the cabinet, which can only be opened with correct authorisation such as PIN/Card access. The door will unlock, and the user will only be able to remove keys that they have access to (indicated by an LED). 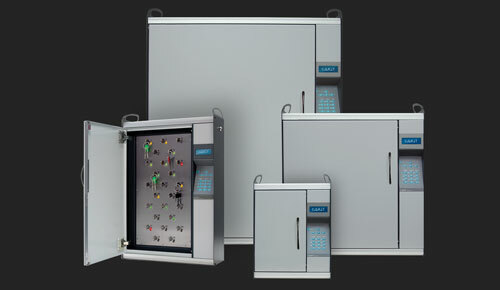 The C.Q.R.iT® is simple to access while maintaining security of your valuable assets. 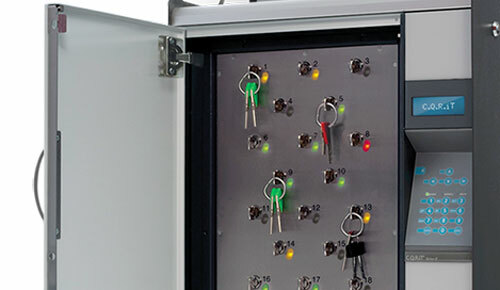 To ensure that there is no weak link in the chain of security, key bunches are secured using Tamper-Proof Key Rings® that prevent inappropriate removal. The individually-serialised key ring secures your keys to a carrier key that fits in a unique key position in the cabinet. Know who accessed company assets e.g. vehicles. Identify those responsible for speeding/parking fines. Reduce theft and stock losses. Reduce the cost of replacing keys or re-keying locks. Stop unauthorised access to restricted areas. Know when your keys are accessed and returned.